at my in-laws home on the beautiful Rainbow River in Dunnellon, Florida. 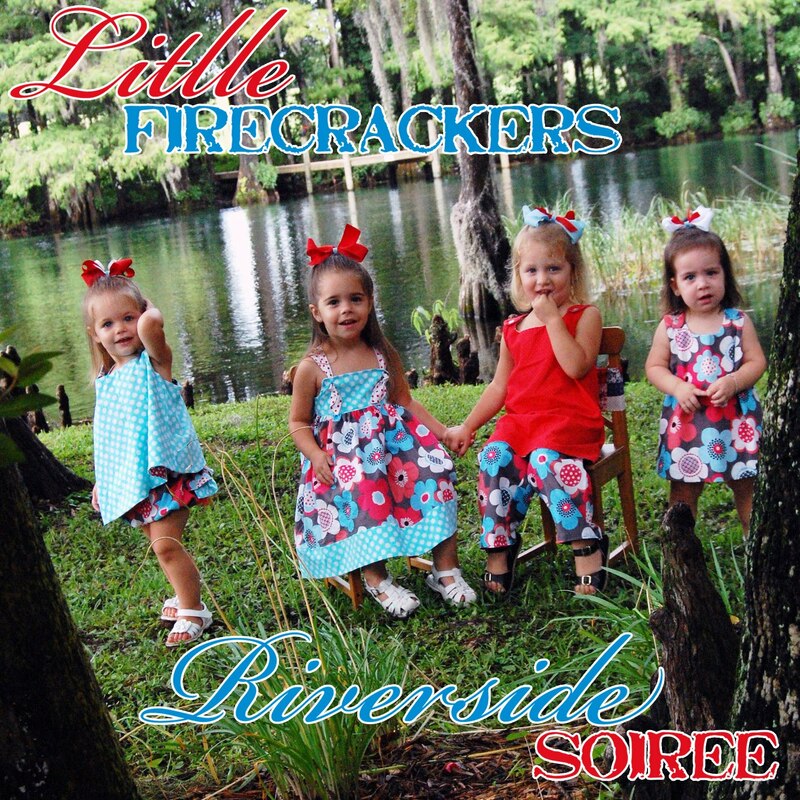 Little Firecracker's 4th of July Riverside Soirée. 4th of July Mini Sparklers created by Marie of Sweets Indeed. Colleen of Happy Little Art etsy shop! I literally just said "awwww" out loud! lol... so adorable! And fantastic choice of desserts and favors! You did a WONDERFUL job!!! So creative, beautifil and detail oriented. I love it!! Girl- you know how to p-a-r-t-y!!!! LOVE LOVE all of it! SUPER CUTE details! Your girls would get along so well with my girls..LOL :) Your photos are stunning! BEAUTIFUL JOB! REALLY?!!! O. M. G. I'm not even playin here... this is THE BEST 4th of July party post I've seen! Truly. Every single detail is dazzling. BRA-VO!!!! Lindsey!!! Soooo fab! I love it! Thanks for stopping by The Hiop Hostess and entering! Stay tuned!!!! Lindsey, everything was amazing! This would be perfect for any summer BBQ! 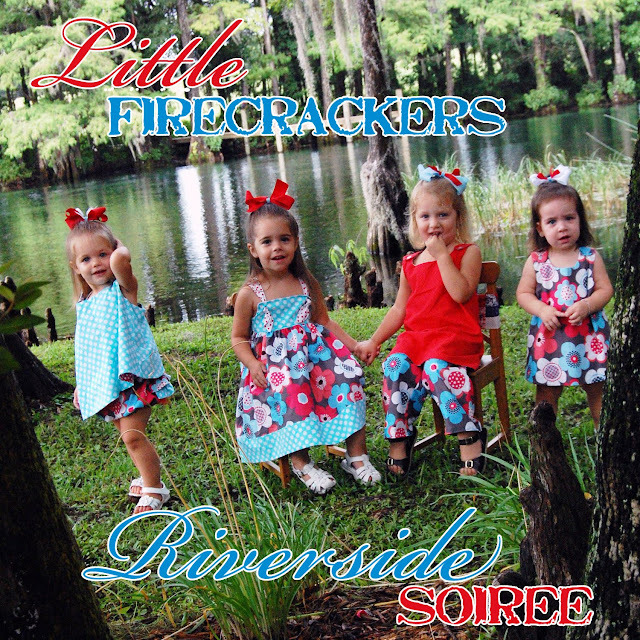 I loved watching the little ones party, it was so sweet (and adorable watching them try to eat the huge marshmallows). Thanks again! can't wait to see part 2!!! YOUR AMAZING!!! Everything looks awesome!! So proud of you and all your accomplishing!! SO super cute & adorable! LOVE your candy kabobs, cupcake toppers, & favors! Lindsey, this is too cute for words!...And the natural setting is amazing! SO lovely! the details are just perfect...and the setting...right on the river...well it's just spectacular!! everything looks beautiful! Super cute...were those marshmallows dipped in colored sugar? Loving every detail. Wow! This is really beautiful. Great styling, and great treat ideas!!! Truly amazing work!! I admire your attention to detail!! Thanks for such a special and memorable weekend! Wow that is quite the party decor. It's all soo lovely! Love it all! I love using the toppers at my party! Thanks for letting me share with everyone! Everything is so beautiful! So amazing! What lucky little girls to have such a fabulous 4th of July party. I love it all! Beautiful! Oh wow!! This is incredible! I can't get over every single element and detail. LOVE the bucket of cherries. I did a little 4th of July event too...now I wish I could have seen this first lol. I am extra impressed and inspired. I love it! Fantastic attention to detail. Thank you so much for choosing to use Sweets Indeed's candy kabobs as pat of your adorable creation! Love the Chocolate? covered apples almost as much as the candy kabobs!! These pictures are stunning!! Just Beautiful!! !Thank you so much for including my Shovel Favors at your party!! Wow! Perfect in every way! Especially the river setting itself! It looks like a fake backdrop it's so dreamy. What an amazing place to create family memories to last a lifetime. Thanks so much for sharing. MORE Inspiration into Reality... coming soon!